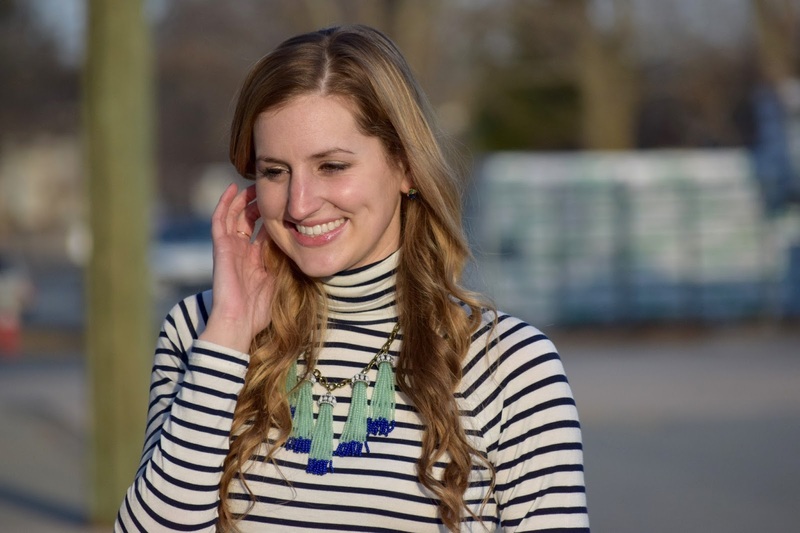 Classic Stripes, a Statement Necklace & Bachelor Gossip ~ Roses and Rain Boots . Like most I have Spring Fever already and bad! I'm ready to put away the neutrals, tights and heavy sweaters and opt for bright colors, tassels and lighter layers. Prior to Lent I purchased this necklace and knew instantly it was going to be a favorite. I rarely pay full price for something and this necklace was no exception. I was actually worried it was going to sell out but I also couldn't rationalize spending $60 on a necklace! So long story short it eventually went on sale for 40% off and I immediately jumped on this opportunity. PS-I'm sorry about not posting this yesterday and missing their promo. I had to unsubscribe from most retail emails so not to be tempted. So today's arm candy is all about the tassels. I ordered the white beaded bracelet from Etsy and cannot wait to get another. I also mixed in a wrap bracelet and some gold Alex and Ani's. I especially love these because I a sucker for a good sentimental quote. What is your favorite Alex and Ani bangle? If there is one thing you are going to purchase this spring go for something with stripes. 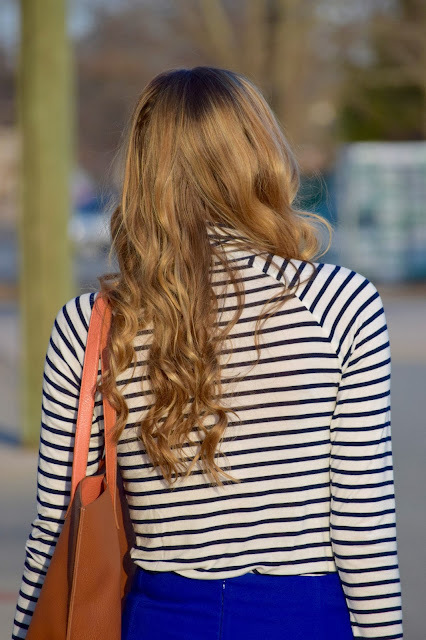 Whether it be a comfortable long sleeve top or nautical type-dress, stripes are a staple trend that never go out of style. They are basically a neutral because they are so versatile. Stripes are also a great starting point for pattern mixing with some floral or leopard print items. Now y'all know how much I love J.Crew and one of my most purchased items is their wool pencil skirts. However; this skirt is not from J.Crew it is actually from Express. I purchased this in college because the quality was there. This skirt has survived many trips to the rug for read aloud and it still looks brand new. And if that's not enough this cobalt color is immediately attention grabbing and as a result I had to get it. Also if you haven't gotten this bag yet you need too! Two of my close friends have purchased it since I received it as a gift and we all rave about it. It's also under $50 too. You can find different variations at Madewell, Nordstrom, Urban Outfitters and Grace (Boutique). PS I am obsessed with this one! UPDATE: So I had to update the post this morning to get the gossip going about what y'all thought about last night's bachelor finale?! Oh my goodness the whole time my mother (who I made watch it with me) and I were sure it was Jojo much to my surprise and hope he chose Lauren B! YAY! And I know most people are SO disappointed by this but like I said yesterday nothing against Jojo, she is absolutely stunning I just didn't see her and Ben together, which brings me to my next point... Her being the new bachelorette! I am confident she will be great and find her "true love". Don't forget to get in on the convo by leaving some thoughts in the comments section (Found at the bottom of the post). Can't wait! PST... have you follow me on Blog Lovin' yet... click the link below or the sidebar. You won't be disappointed! I adore the stripes and that necklace is gorgeous! Thank you! I was super excited about it!! Thanks Meghan! And I especially loved that it was on sale! Your styling is on point! Love this! That's so sweet, thank yo Cielo! Love how you styled this! I was totally team JoJo (Lauren was adorable, though!) so I was so happy she was named the next Bachelorette...but seriously, what do we watch on Mondays now!? Loving the pop of blue with the stripes!! Great look! !